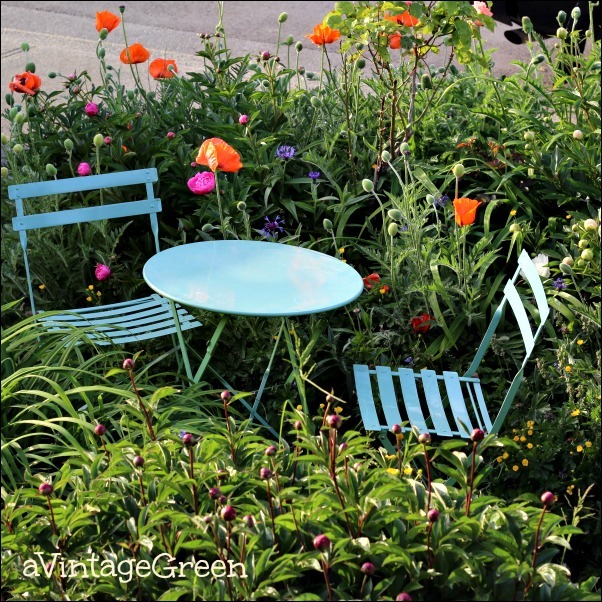 What could be better than a folding bistro table and two chairs in the garden? Garage sale find. This set is in a somewhat longer view of my Sunday flower post here. I have been collecting cutting boards for awhile and, after buying Donna of Funky Junk Interiors' stencils, I have been practicing and learning. My previous stencil posts are here and here. I stencilled three more cutting boards. I learn something new each time I use a stencil. MUST remember to use VERY little paint on the sponge. I was studying Betsy's of My Salvaged Treasures stencillng here and love her creativity in adjusting the stencil lettering to make a NEW word. Learned that paint mistakes can be washed off a cutting board right away and if the paint is mostly dry a sharp knife and a steady hand can clean up some of the bleed through on words. 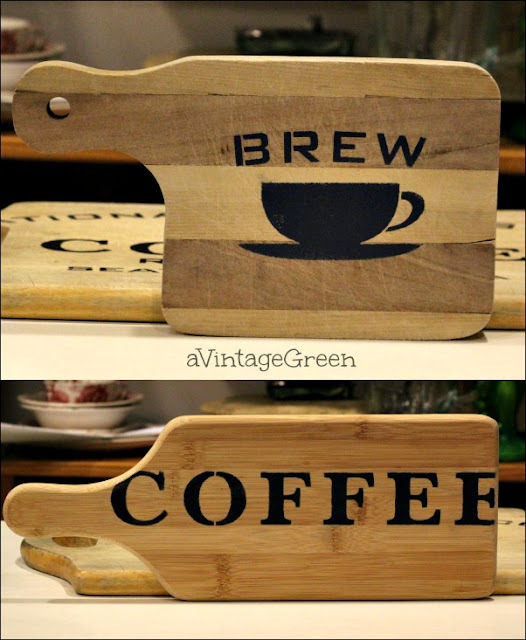 I also used long making tape on the cutting board tight to the COFFEE word (below) and that gave me cleaner edges and coloured guidelines under the stencil. 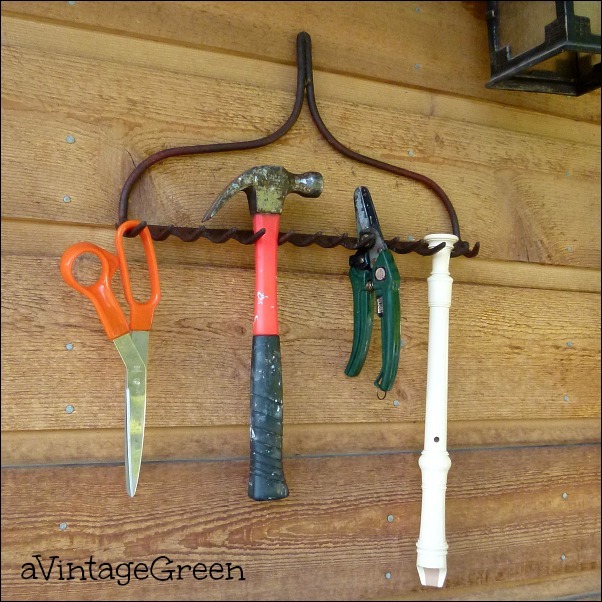 Found 4 this month - so many uses for these vintage rake heads. Just check Pinterest. I typed rake ideas in the search box and WOW, hundreds of great ideas. Rusty tool boxes. Love them. Great storage. Here are two very small toy kitchen accessories - cutlery holders. One little tray fits on my hand. Small lion cookie cutter, a spoon, a fork and a plastic tiny spoon were included too. 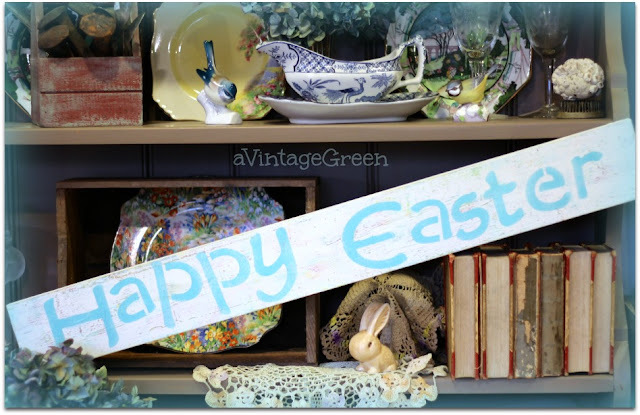 Spring has so many wonderful church and garage sales and the quest for finding great vintage stuff is a continuing incentive for getting up EARLY on Saturday mornings. I'm coveting your bistro set. I want one for my backyard. I have no idea what's eating my plants, but I'm guessing it's deer or a bunny. I just hope whatever it is doesn't come back. Those cutting boards are amazing. You did a fantastic job. I found some labels I'd like to copy on to some round pieces; either cutting boards, lazy susan's or table top... I am going to read your tutorial and see if I can make this work for me! Those tiny cutlery sets remind me of the one I have and used just yesterday in a Tea Party for my grand quads. When their mother, Amber, was just a little girl, I bought a tiny set at a local shop. I kept them for year as just a display/decoration and it is so exciting to see my grand quads use the tiny teaspoons to stir tiny spoons of sugar into their tea for our Wednesday afternoon tea parties! I do so love all of your posts! I have missed seeing our brother's blog lately....life gets in the way. I must check him out to see if all is well with him. Hi Joy ... you are really getting creative with those stencils. I orders some of Donn's stencils too, but have not had time to use them. I like what you did on the cutting boards. I wish I had a good spot for a bistro table and chairs in my planter beds or wish I had a planter bed that looks as pretty as yours does. Love the look. Hi, your are creative with stencils..maybe you'd send a little this way. Love your finds and the cutlery set is adorable! I also love old toolboxes too, can't have too many of those. Oh, oh, oh! 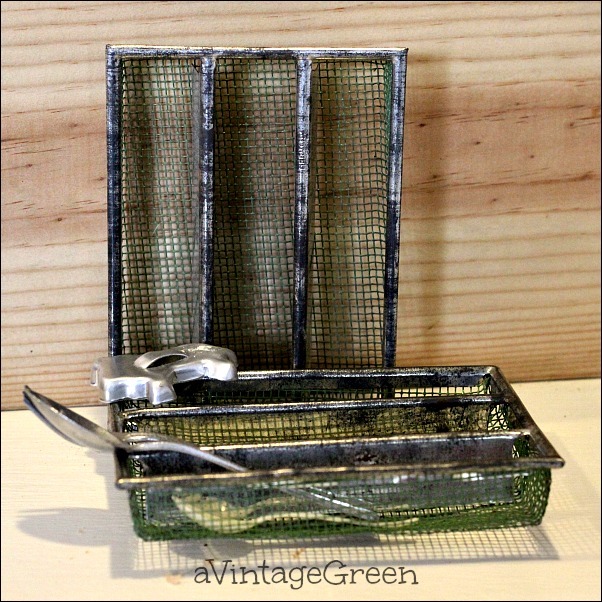 Love the utensil trays and the bistro set and the rusty toolboxes and everything. Great job wrapping the stencil letters around the curves in the cutting boards. 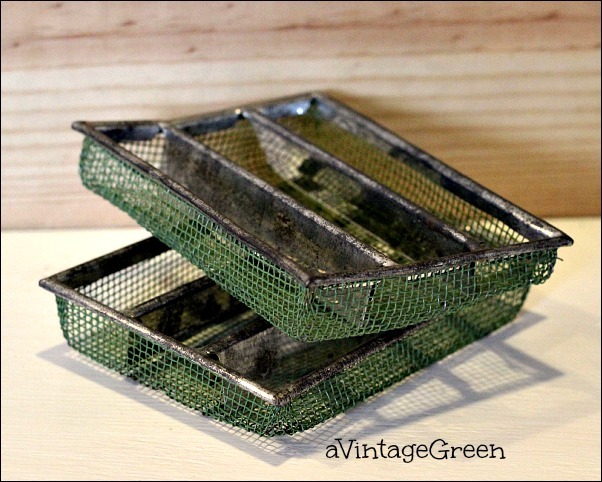 Like your vintage garden! Tge folding bistro table and chairs look very lovely. Have a nice weekend. Your stenciling looks fabulous. I love the cutting boards. The burnt marks add a little more flavor. I LOVE stencilling cutting boards - yours look fabulous !!! And that bistro set is the sweetest thing - love the color - was that the color it was or did you paint it? What great treasures you found! I love the stenciling on the cutting boards. 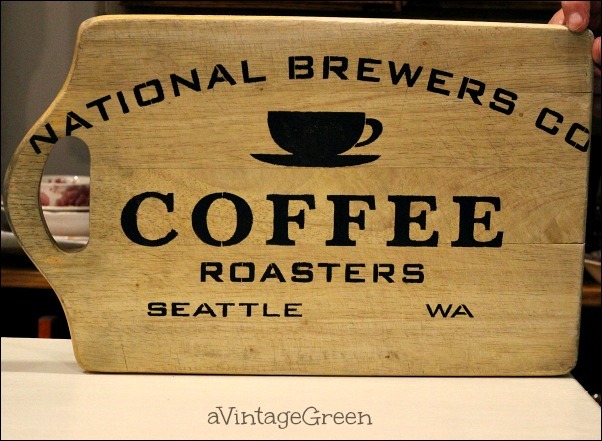 I have been in love with vintage cutting or bread boards lately and have found three. And I just started stenciling again so you have inspired me to do something with both! The cutting boards turned out great with the stencils! Great finds! Love your bistro set in the garden and the cutting boards turned out great with the stencils! 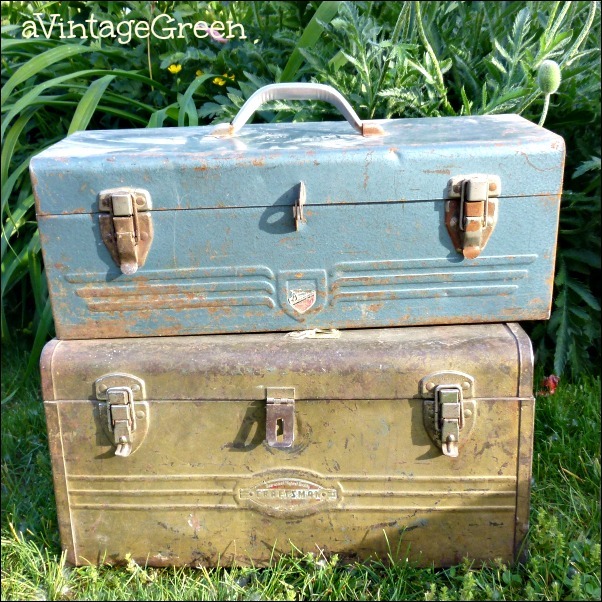 Thank you for sharing with the Say G'day Party as your posts always make me smile Joy! Thank you for the link backs! GREATLY appreciated! Pinned!